In today’s always-connected world, businesses need to be available to their customers, prospects and employees 24/7/365. This new world order of uninterrupted technology is a non-negotiable business best practice. To experience downtime of any length of time—even for a few minutes—with data and applications unavailable, puts a business at risk for irreparable harm to its hard-fought brand. 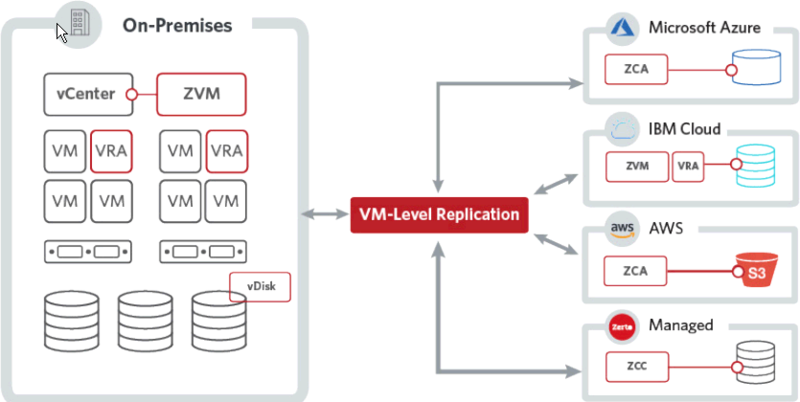 Zerto Virtual Replication 6.0 introduces enhancements aimed at long-term retention use cases, such as Journal File-Level Recovery (JFLR) for Linux file systems, significantly improving data protection and recovery. Zerto IT Resilience Platform includes out of the box analytics to provide real-time and historical analysis with dashboards and dynamic reports for monitoring across multiple sites and multiple clouds. This ensures that recovery point objective (RPO) SLAs are achieved and issues are quickly identified to minimize risks to the business. Zerto Virtual Replication 6.0 expands Zerto Analytics with new dynamic analysis reports for network troubleshooting and optimization. • Achieve inter-cloud workload mobility and protection between Azure, IBM Cloud, AWS,and more. • Failback, protect and recover production workloads out of Azure, IBM Cloud, AWS,vSphere, and Hyper-V.
• Replicate between Azure regions with complete intra-cloud replication and the ability to protect, recover and migrate workloads within Azure. Resilience: Remove lock-in, unify, standardize and evolve IT with storage and hypervisor-agnostic replication. Hybrid Cloud – Multi-Cloud: Bi-directional mobility for Microsoft Azure, IBM Cloud, AWS, and vCloud Director enables true hybrid cloud mobility, and efficiency. Zerto Analytics: SaaS delivered real-time and historical analytics and reporting of protection and consumption data. Zerto Mobile: Securely monitor protection across multiple sites anytime, anywhere, on mobile and tablet. Simplicity: Single platform for data protection, recovery and mobility across multi-site, multi-cloud environments. Always-On: Data loss in seconds & continuous replication of VM block-level changes with no scheduling. Granularity: Rewind & recover files, VMs and applications from any point in time in the last 30 days. One-to-Many: Simultaneously replicate VMs locally, to multiple remote sites and public or managed clouds. Automation: DR process automation, recovery service orchestration and custom pre-/post-recovery scripting. REST APIs: Fully automate deployment, protection and testing with easy-to-use, ready-made example scripts. Prove Compliance: No-impact failover testing and reporting to prove recovery in minutes during working hours.